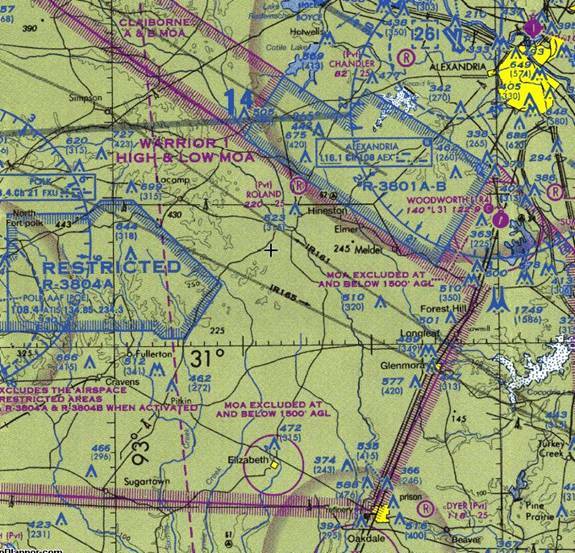 Special Use Airspace (SUA) is designated to indicate areas in which extraordinary flight conditions exist or may exist. These airspaces are categorized according to the degree of hazard to non-military air traffic using these airspaces. Most flight training texts limit the discussion of SUA to the limitations placed on civil aircraft operations in these areas, without bothering to explain the exact nature and cause of those limitations. The result is pilots who have a flawed understanding of SUA. The goal of this discussion is to provide a more in-depth understanding into the concept of Special Use Airspace, allowing civil aviators to operate safely while utilizing the National Airspace System. The most restrictive SUA is the Prohibited Area. The purpose of the Prohibited Area is to disallow all flight operations inside the area for reasons of national security (obvious or obscure). All aircraft, civilian and military, IFR and VFR, are excluded from these areas unless specifically allowed. The openness of American society mandates that Prohibited Areas are small and very limited in number. They are usually found around nuclear weapons facilities and certain political sites. Information concerning the size, altitudes, and hours of operation can be found listed on the end flap or the bottom of the sectional chart. Note that in the column headed Controlling Agency, the contact is typically listed as “No A/G.” This means that no air-to-ground frequency is available, since entry will normally not be granted anyway. The purpose of the Warning Area is to advise pilots of all aircraft, civilian and military, IFR and VFR, that operations hazardous to air traffic may be conducted in the Warning Area. These operations may include live-fire exercises. Warning Areas are always found offshore in international airspace. Since the United States government has no jurisdiction in these areas, entry cannot be denied to any aircraft, civilian or military. Since the open ocean provides a relatively safe environment for naval weapons practice, flight into an active Warning Area is unwise. Information concerning the size, altitudes, hours of operation, and the Controlling Agency can be found listed on the end flap or the bottom of the sectional aeronautical chart. The purpose of the Restricted Area is to separate positively all aircraft, civilian and military, IFR and VFR, from specific hazards to air traffic. These hazards include especially dangerous military operations and fixed obstacles to aerial navigation. Specific clearance is required from the controlling agency before a pilot may enter Restricted Airspace. Restricted Areas are found on the sectional aeronautical chart surrounded by a blue hatched line and numbered in the format of R-XXXX. They are always found within the confines of United States airspace, allowing the controlling agency to control legally the flow of air traffic in the Restricted Areas. Among the hazards that may be present in Restricted Areas is live-fire exercises. However, this threat is uncommon, and is limited to totally unpopulated desert areas actually owned by the government specifically for this purpose. Refer to R-3801 A-B on Figure 1. Since common sense dictates that live ordinance is not being deployed in the middle of Louisiana, a different type of aerial hazard must exist. In this case, military aircraft use this airspace to practice aerial refueling. Aircraft engaged in air-to-air refueling have very limited maneuverability when encountering conflicting traffic, so civilian traffic is restricted when these exercises are in progress. Information concerning the size, altitudes, hours of operation, and the controlling agency can be found listed on the end flap or the bottom of the sectional aeronautical chart. The communication frequency for the controlling agency is not listed anywhere on the sectional aeronautical chart. The best way to determine the most appropriate frequency is to reference the ARTCC section of the applicable Airport/Facility Directory. The purpose of the Military Operation Area (MOA) is to separate high-speed military air traffic from IFR traffic. Inside the MOA, 14 CFR, Part 91 rules are suspended for military aircraft. Military pilots operating legally in the MOA are not required to observe any airspeed restrictions, minimum altitude restrictions, Class-E, or Class-G airspace rules with regard to visibility and cloud clearances. For this reason, pilots of civil aircraft operating under Instrument Flight Rules cannot be provided positive separation, and are therefore not allowed to fly inside an active MOA. Pilots of civil aircraft operating under Visual Flight Rules, however, are not bound by this restriction. Civil pilots may conduct VFR operations without any contact with the controlling agency, as long as they accept that they are not being afforded the total protection afforded by Part 91. Military Operation Areas are found on the sectional aeronautical chart surrounded by a magenta hatched line and identified by name. They are always found within the confines of United States airspace, allowing the controlling agency to control legally the flow of IFR air traffic in the MOA’s. Since civil air traffic is only partially excluded from active Military Operations Areas, these areas are not used for live-fire exercises. One interesting aspect of operations in MOA’s is the restrictions placed on military pilots using them. Military flights are required to enter an MOA on an instrument flight plan, using a Military Training Route (MTR), such as IR161 (See Figure 1). Once inside the MOA, the instrument flight plan is cancelled, and the flight is continued without the restriction of Part 91 rules. Once the flight plan is cancelled, the MOA becomes active, or “hot”. When the exercise is completed, the military pilots open another IFR flight plan and depart the MOA, using an MTR, such as IR165. At that time, the MOA becomes inactive, or “cold”. This means the Flight Service Station may be a better source of information on the exact status of the MOA than the listed controlling agency, since the Flight Service Specialist can match activated and deactivated flight plans filed by military flights using the MOA. Note the magenta ring around Elizabeth, Louisiana, on Figure 1. This is an example of exceptions to the MOA that are found around populated areas and airports that underlie a LOW MOA. In this example, the good citizens of Elizabeth are afforded the benefit of Part 91, and are thereby spared experience of F-16’s streaking down Main Street at 500 knots and 200’ AGL, ignoring traffic signals and posted school zones. Civil aviators operating in an active MOA may do so legally and prudently if they completely comprehend the precise nature of the hazards associated with this airspace. Visibility and cloud clearance requirements prescribed by regulation for Class-E airspace and Class-G airspace may not be adequate to render the see-and-avoid concept of traffic separation valid. Thus, civil airmen must be prepared to observe inflight visibilities and cloud clearances that appropriately exceed the regulatory requirements. The purpose of the Alert Area is to instill awareness in pilots operating in these areas that a moderate hazard exists. Examples of these hazards are high volumes of student jet training activities and high volumes of helicopter and seaplane operations. Although the hazards may seem similar to those found in MOA’s, all pilots operating in Alert Areas must operate in compliance with Part 91 rules. Alert Areas are found on the sectional aeronautical chart surrounded by a blue hatched line and numbered in the format A-XXXX. They are sometimes found offshore, usually within the U.S. territorial limits. Information concerning the size, altitudes, and hours of operation can be found listed on the end flap or the bottom of the sectional chart. Note that in the column headed Controlling Agency, the contact is typically listed as “No A/G.” This means that no air-to-ground frequency is available, because no clearance or permission of any type is required for IFR of VFR flight into or through an Alert Area.